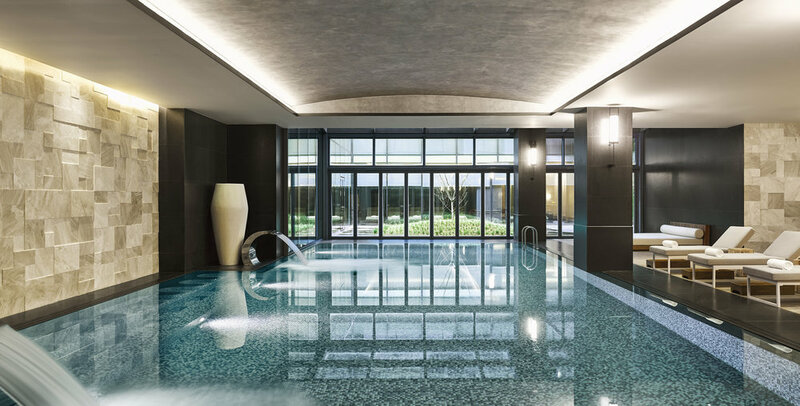 Fairmont Quasar Istanbul is a tale of two sisters representing the eternally stylish New York and Paris, respectively. Istanbul provides a third component and sets the perfect stage for the sisters to reunite. Set on the site of a former Art-Deco liquor factory designed by architect Robert Mallet-Stevens, the hotel blends a sense of urban culture and industrial flair with the city's storied traditions and strong sense of place. Industrial elements inspired by the historic liquor factory are meshed with modern materials and interesting forms to create layered details in the truly unique guestrooms, and Turkish design is captured through local touches and custom-made pieces. Beds feature blue leather and tufted headboards, inspired by the Bosphorus, and have a custom extruded lumbar support. The desk serves as a multi-functional space for working, dining or lounging. The serviced apartments showcase old photos of the original liquor distillery, and cove lighting creates a warm glow and makes the apartments feel more residential. Serviced apartments also contain an owner’s club lounge, which is set in one of the hotel’s sky gardens. This exclusive retreat has both water and fire features, which create a balanced, Zen retreat for the owners. Inspired by Turkey's centuries-old spa culture, Willow Stream Spa offers signature treatments, including the traditional Turkish bath, in a layered, relaxing, sensorial space. Treatment rooms are cast with shadow, as perforations of soft light sparkle through the custom metal ceiling screens. This traditional Turkish “Hamam” spa features white-on-white, marble-clad walls and benches, finished with traditionally inspired Turkish faucets and hardware. The indoor pool area boasts tumbled limestone, honed black granite and teakwood and is lined with mixed silver mosaics, highlighted with custom sconces draped from each column. The gym is an industrial space, featuring black paneling and white subway tile. Industrial-modern architecture pairs with eclectic furniture elements to set the stage for a unique dining experience. The dark metal framework and back-lit glass ceiling paneling juxtaposes warm wood floors and antique Turkish rugs. Graphic text inscribed on the wood of the central columns serves as an homage to the original liquor factory. The dark wood floor of the Tea Parlor is laid in a traditional herringbone pattern, opposite a geometric ceiling installation. A Turkish-inspired rug anchors the furniture, as antique mirrors and references to Art Deco contrast the clean lines of the connecting Patisserie. Combining Turkish heritage and culture with contemporary cuisine and ingredients, Aila invites guests to experience traditional Turkish mezze and ocakbasi culture in a chic ambience. The restaurant reflects the vibrancy and shifting energy of Istanbul during the passing of a day: from the break of dawn and late into the night. Four distinct spaces take diners on a journey as they feel the tempo of the city fluctuate with the passage of time.